Front zip, all stretch lace LDS Temple dress is fully lined in soft, light weight denire. A beautiful satin rolled collar and a-line style is flattering on any size or shape. A perfect dress for women with distinct style yet love an easy fit for quick changes. I am so sorry, I had to return the dress. Even a small was too long and the sleeves seemed large for smaller arms. However and XS would have been too small for my bust. I had such hopes that I had finally found a temple dress that fit me properly. Thank you. Have referred your White Elegance business to others. I love the dress….the first few times I wore it to work in the temple, I received many compliments on it. That said, though, purchasers should be warned that the lace catches on everything and anything— dressing cubicle door latches, drawer pulls, door handles, etc. Also, though I realize it is designed to fit many body types, for me the size Small (which is appropriate for most of me) is a bit too short, and the shoulders are not wide enough. 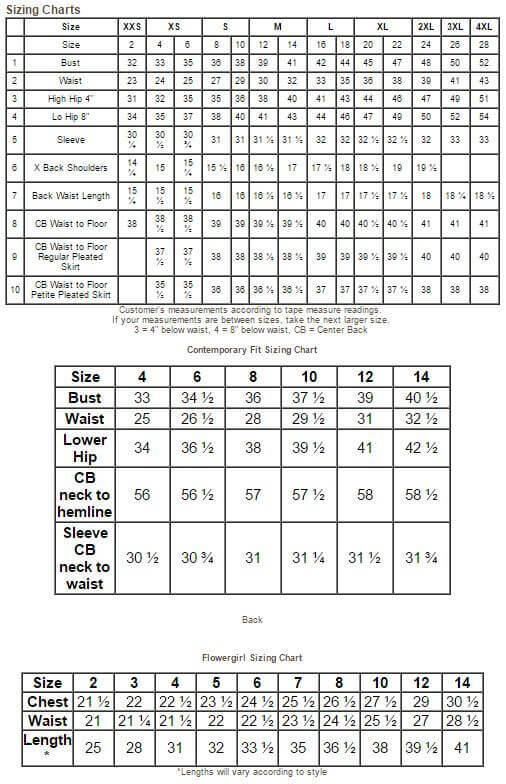 If I bought a Medium, the length and shoulders might be OK, but the rest would be too large. 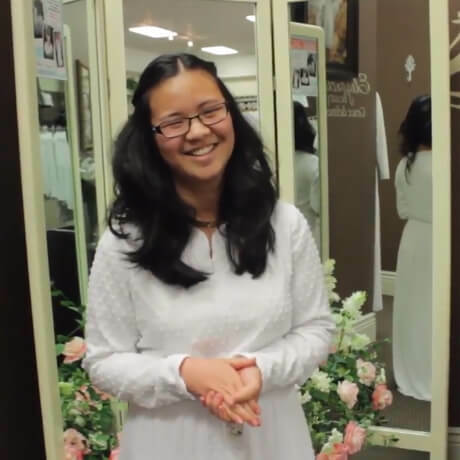 A couple of good points, if most temples are like mine: The dress is quite warm (the lining and lace are both fairly heavy), and it doesn’t seem to wrinkle much at all. This dress is nice quality, but it just doesn’t fit me right. I will probably be returning it. My mother in law looked beautiful and peaceful in her dress. Unfortunately I got it for her to be buried in, but I highly recommend White Elegance. The staff was very helpful in helping me get just the right dress for her. I am very pleased. I initially ordered this for my Mom and she was so excited and it fix perfect with the exception of length but that is an easy fix. She said it made her feel like a princess and so looking forward to going to the temple in it. Wouldn’t shop anywhere else. Never wrinkles and front zipper makes it so easy to get in and out. Fit me perfectly after taking up the hem. My favorite temple dress. I am planning on being sealed in the temple and wanted a special temple dress for the occasion. When I received this dress I was just delighted! It is so beautiful! It fits very well. The only thing is it doesn’t have a hem and is a little long so I will take it up and it will be perfect! I am looking forward to many years wearing this beautiful dress every time I go to the temple. I absolutely love my new temple dress. It is so classy and elegant. I love this dress because it is comfortable and doesn’t wrinkle and is easy to put on with the front zip. It is hard to find a dress with all of these qualities. 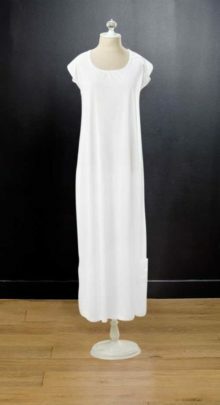 This is a beautiful, elegant, graceful and COMFORTABLE dress. I am thrilled with my purchase. Thank you White Elegance for carrying petite length dresses. It saves me precious time hemming up dresses. I love this dress, it’s my second one because I wear it at least once a week! 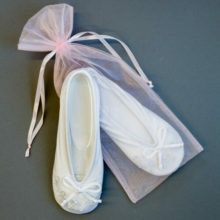 Soft padded slipper with stretch satin upper and grey leather bottom. 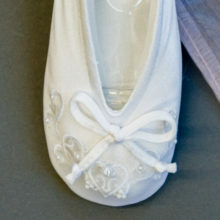 Beautiful embroidery on toes with bow.